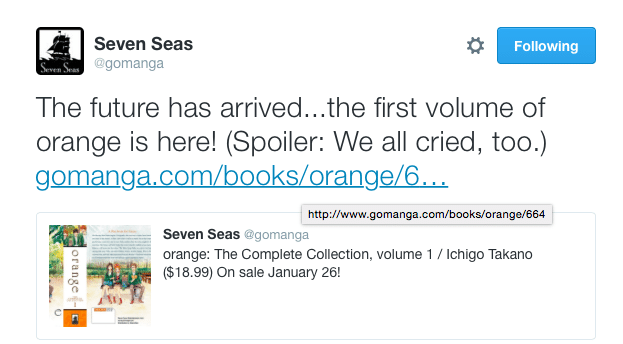 Orange (Takano Ichigo) Volume 1 Now on Sale Through Seven Seas! Everyone has regrets in life. So who wouldn’t take the chance to change the past if given the opportunity? When sixteen-year-old Takamiya Naho receives a mysterious letter, claiming to be from her twenty-seven-year-old self, her life is suddenly thrown into flux. The letter tells her that a new transfer student by the name of Naruse Kakeru will be joining her class, and to keep her eye on him. But why? Naho must decide what to make of the letter and its cryptic warning, and what it means not only for her future, but for Kakeru’s as well. You can also check out my in-depth review of the series for more information. This is definitely one of my favorite little series, full of heartwarming moments and just touching, overall. Volume 2 is scheduled to come out in May though it is also available for pre-order through Amazon. In more Takano Ichigo news, our dear mangaka does have a new series out called Re-Collection. There are very few chapters out as of the moment so I probably won’t be doing a review any time soon, but you can go ahead and check out the three chapters which are out on Crunchyroll. Her previous work Yume Miru Taiyou was also well-received. It looks like the success of Orange has led Takano Ichigo sensei to pivot more towards the mystery and supernatural genre… here’s to hoping that she comes out with more great works in the future!